A Delegation from Shaanxi province, China, visited the Bulgarian Chamber of Commerce and Industry (BCCI). 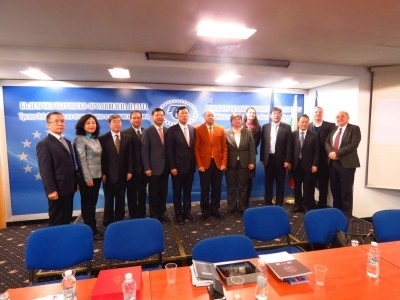 The Commercial Counsellor at the Chinese Embassy in Sofia - YAO Chaoying, a team from the Ministry of Foreign Affairs, headed by Margarita Ganeva, Director of “Foreign Economic Relations” Directorate, and experts working in the field of cooperation under the “16+1” initiative, also took part in the discussion with the Chinese delegation. The delegation was led by the Vice Governor of Shaanxi province Wei Zengjun. He outlined several levels of cooperation: preservation of the historical and cultural values, agriculture - wine, rose oil, yoghurt, aviation industry, etc. Shaanxi province ranks 15th by economic development in China. Since 2015, the state has encouraged the province's participation in the Belt and Road Initiative to develop more intensively. To this end, the Silk Road international exhibition is organized. In 2018, 57 countries took part in the exhibition and the UK was a special partner. At the event, contracts for trillions of yuan are expected to be signed. In the period 11 - 15 May this year, the next edition of the exhibition will be held with 300 thousand square meters exhibition area. During the meeting, an invitation was extended to Bulgarian companies and the BCCI for participation in the exhibition. There is an idea that Bulgaria will be a special partner of the event for one of the next editions. BCCI President Tsvetan Simeonov stressed that besides agriculture and traditionally known products in China - wine, essential oils and yoghurt, the Bulgarian business can offer a variety of goods as well as machinery and equipment for the processing of agricultural products, spare parts for the aviation and automotive industries, and furniture industry, in view of the large quantities of timber produced in the Shaanxi province. He pointed out that tourism is also a possible area of cooperation, but there is a need to facilitate the issuance of visas and to open direct transport links. Additional information was requested from the guests on the cities in Europe with which the province's capital Xi'an maintains direct flights, so that convenient passenger routes for both business and tourism can be found.